I have always wondered what it would be like to fly. As a kid, I used to pretend that I was an airplane, a bird, anything that flew through the air. I have always wondered what it would be like to fly. As a kid, I used to pretend that I was an airplane, a bird, anything that flew through the air. I ran through the yard with my arms spread out like an airplane, simulating weird engine noises whenever I would make a turn or go into a steep dive. Well, last weekend I got to fly for the first time, and it wasn't by riding in an airplane. It was by jumping out of one. Yes! 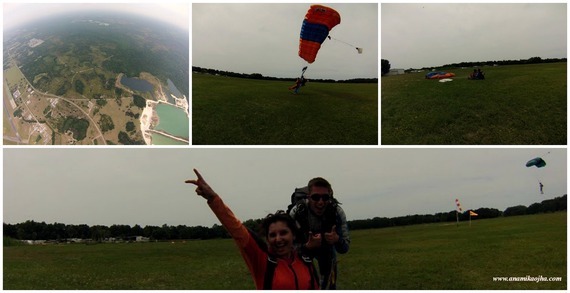 I did Skydiving. Yes! I did my first jump. Skydiving has always been of interest to me as a natural consequence of my desire to fly. I have always wanted to do it, but never thought that I would be doing on my birthday month of this year. My friend took an initiative and booked our weekend slot at Skydive City/Z-Hills, Florida. We got 2:00 PM slot but unfortunately the winds didn't supported us that day. It was re-scheduled for next weekend at 10:00 AM slot. Finally the D- Day came. I reached the Skydive City around 9:30 AM, hoping to return with my mission accomplished. I checked in at the reception. 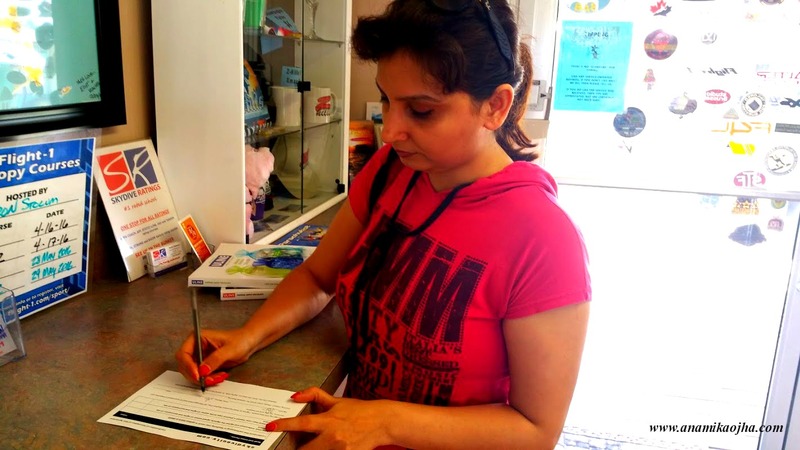 As I had already completed the multiple online paperwork, where basically you sign your life away and waive the Tandem of any liability in the event of a mishap (injury or death), I just had to sign the waiver that I already read all the safety rules and watched their video and responsible for my life. This may look to you as the hardest part where you're gambling your life but in reality I didn't feel anything as I didn't want to go home without diving that day! As I came out of the reception, I looked at the sky. 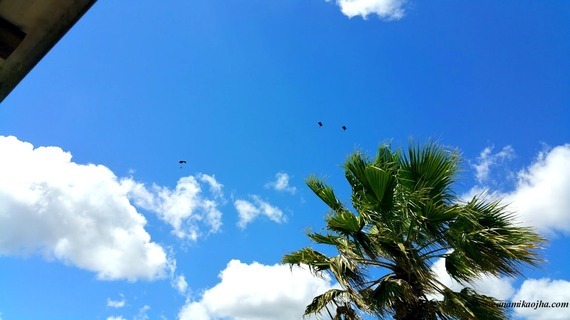 It was clear, blue and sunny with cool breeze. It was a perfect day for sky diving. I thanked God for that beautiful day and prayed that the weather should not change before my jump. Before your turn comes for diving, you have endless time of the world to think about anything you want, your work related or you want to give a thought on yourself or you can even think about the song that you want to put in your Sky diving video to divert your mind from freaking out. Well, I was chilling with my friend getting our endless pictures clicked as it would be the last day of our life. We were singing, eating apples and thinking about what to do next after sky diving? No matter whatever the time of your Tandem slot is given, you have to wait for at least minimum 3-4 hours depending upon miscellaneous reasons. You will see number of people climbing the airplane and landing through parachute. Videographers and photographers would be clicking their endless pictures and family and friends would be waiting on the ground. You'll get fascinated in 2-3 take-offs and parachute landings but later you'll give up and desperately waiting for your turn. As soon as I heard the announcement of our group, I was waiting for my instructor - Ilya who came in few minutes and introduced himself. He gave me the jump suit to dress myself over my clothes. The jump suit was little loose but then he fixed the harness and it was looking fine. He also fixed diving goggles on the side of my arms and told me that he'll give me inside the airplane. My photographer Paul took my interview video and asked several questions whether I was nervous or was it my first jump etc. He instructed me to look up while diving and smile in front of camera, look for his sign when he'll give me to hold his hand and I have to let him go as per his sign. I wasn't nervous that time. I was feeling very excited as if I was going to war front to save my country. Later my instructor Ilya gave me 5 minutes Skydiving training - cross arms, head back, knees bent, jump. One tap on the shoulder to open your arms. Second to brings arms to chest as the parachute opens. Knees bent for landing. Questions? I asked him only one question - "How many jumps he did before?" He smiled and replied, "I have done more than 4000 jumps that now I have lost its count." Then I had full faith in my instructor as if nothing will happen to me. And I was in safe hands. Within 15 minutes, Ilya took me to the airplane boarding area and I was about to climb. By that time, I knew that it was the time of no turning back and not freaking out as now universe also conspires me to jump! We're in. The door closes. We're off. Squashed into two benches that face one another. 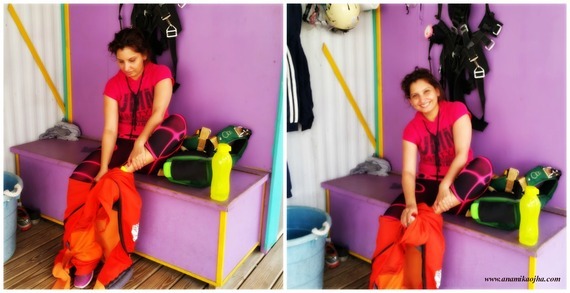 In my group, there were 9 solo divers and 3 of us were jumping Tandem with an instructor along with three cameraman. We all were crammed on the benches cross legged facing each other's back. At 6500 Ft, my cameraman Paul asked me how was I feeling? I thought it was such a stupid question as everyone knows what would be the condition of any first timer! My heart was beating fast and I was little nervous, trying to overcome my fear by smiling and looking out of the window. As soon as I saw all the solo divers jumping out of the plane as if they're going to party, I was fascinated by that sight. It was looking surreal from the airplane window. At 10,500 feet, Ilya nudged me towards the open door. Standing at the edge of the door and looking out at the vast openness below, I must trust you to believe that I am not trying to fabricate any sense of bravado when I say that I felt no fear. There was no anxiety, and no tension. I was utterly devoid of pain, grief, and worry. I felt no affliction of the mind or the soul. I looked out upon that beautiful earth and was surprised to feel complete peace within myself. In that moment, I owned the world. I could feel the cool air on my face with the speed of more than 200 mph as if it was welcoming me. However I only remembered the instruction cross arms, knees bend and forgot head back. You must be thinking how I could forget such an important instruction about safety of my life but it happens! 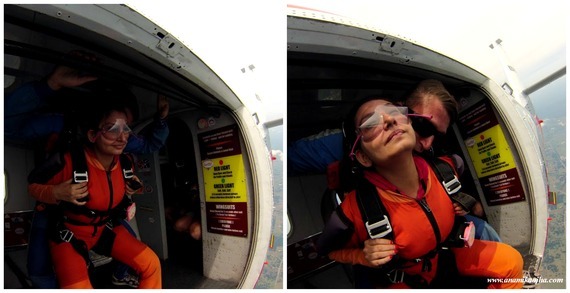 Thanks to my instructor Ilya who bend my head on his shoulder within fraction of seconds before our jump. The first few seconds seemed to be a blur due to the sensory overload. But once we achieved terminal velocity, it was incredible. There was no falling sensation, the kind that one experiences in a rollercoaster. Rather it was almost as if we were floating on a cushion of air. Paul hangs in the doorway like an animated Spider-Man and I know that this is the moment we've been waiting for - the 60 second freefall. Within few seconds of our leap, Paul also jumped to capture us. I had to hold his hand but the air was very powerful and I wasn't able to hold his hands. Then Ilya held mine and Paul's hands together so that he could capture our close-up shots. Then as the Paul gave us signal, we left his hand. He disappeared. Then so did we. 60 seconds later, Ilya launched the parachute and I found myself peacefully floating towards the drop zone. I hear Ilya voice in my ear as he loosens my goggles, unfastens the harness and asks if I'm alright. Suffice to say, that it was exhilarating. Ilya asked me if I wanted some spins on Parachute, I said Hell yeah! Then he spinned our parachute 3-4 times to left and right and it was fun! The parachute ride down took around 7 minutes and the landing was incredibly soft. Wow, this experience was nothing like I had imagined. It was the best moment of my life which I couldn't express in words! 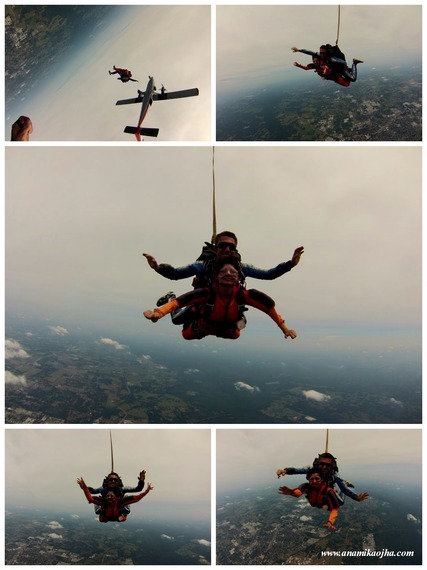 All I can say that I felt freedom, Skydiving is intoxicating more than marijuana/alcohol or any drug on this planet, it's enough to mess with your mind! After my jump, I was feeling top of the world. When it was over I spent a while chatting with Ilya about the dive, and I thanked him and gave him a big hug. I got out of the harness and returned the jumpsuit. 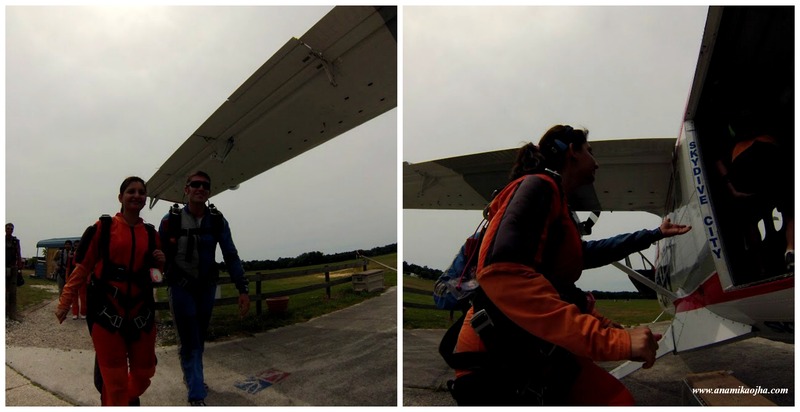 Tandem gave me my first jump freefall certificate. My instructor Ilya also gave me student logbook where he wrote remarks on my first jump that it was nice and I did good job. I also got discount coupons for my next jump as well as was briefed about AFF Ground School programs that teaches you accelerated free fall. The First Jump Course consists of ground school for around 6 hours followed by the student jumping wearing their own parachute system. 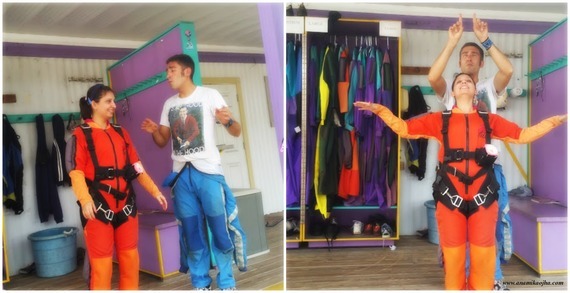 Two instructors accompany the student and will test the student's knowledge during the skydive. The student will free-fall for around 45 seconds, during which time he/she will complete certain tasks assigned for the jump and then pull their parachute at around 5,000 feet. The student is responsible for steering and landing their parachute. 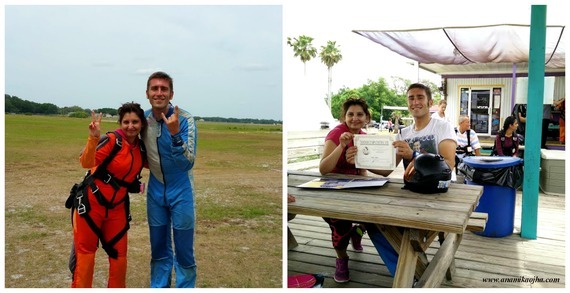 I believe that the awesome power of my first skydive has thrust me a little closer to my existence and changed my perspective about the world. It is an experience that I hope to undertake many, many more times and shall never forget my first jump experience. May be, I will be doing my second jump soon but first jump is always special. If you haven't tried skydiving, I strongly urge you to try it once. It is definitely a priceless experience you'll live throughout your life! This article was originally published on my site Ana's World here. 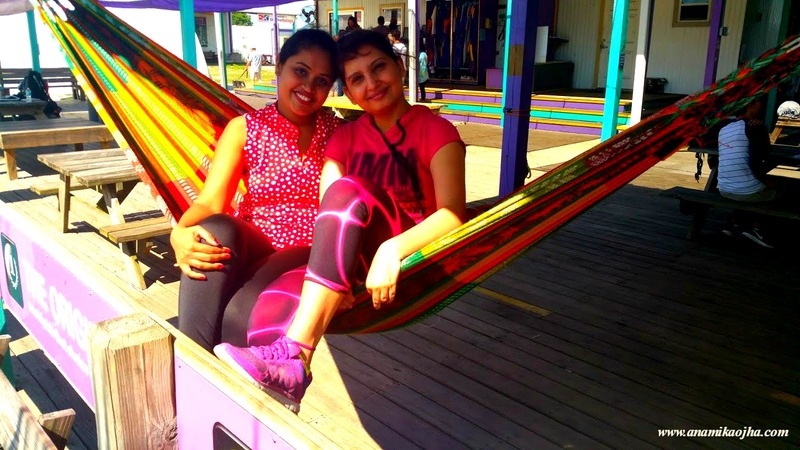 If you loved this article and would like to follow my traveling tales and adventures, do check out my personal site: Ana's World and you can also follow my journey on Facebook, Instagram and Pinterest.